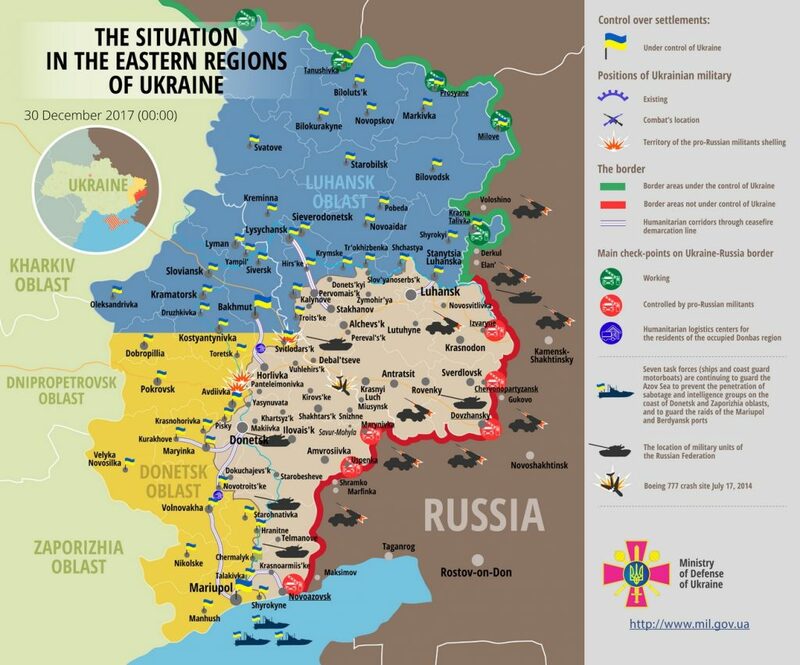 Russia-backed militants violated the ceasefire 6 times in the east of Ukraine yesterday. All of these were direct fire attacks, some involved mortars. Comparing to the previous days, militants resumed attacks in Luhansk sector, reported Ukrainian Ministry of Defense spokesman on ATO Colonel Dmytro Hutsulyak at a press briefing at Ukraine Crisis Media Center. In Luhansk sector, militants violated the ceasefire near Luhanske in the evening. “The attack continued for about 40 minutes. The adversary fired eight 82-mm mortar rounds, in addition to automatic grenade launchers and heavy machine guns fire,” said Col. Hutsulyak. In Donetsk sector, Russian proxies committed three ceasefire violations in the vicinity of Shakta Butivka. “They used predominantly heavy machine guns, various grenade launchers and small arms, including sniper rifles. Militants also fired two 82-mm mortar rounds,” elaborated the spokesman. Near Verkhnotoretske, militants opened fire from automatic grenade launchers and small arms, in the vicinity of Kamianka they used grenade launchers and other light arms. The attack near Kamianka continued for about 90 minutes. One Ukrainian serviceman was killed in action yesterday, this happened near Shakhta Butivka. Two more servicemen were wounded near Kamianka and Katerynivka. Report on the military developments as of December 29 is available here. Interactive data on the shelling: chronology shelling chart and the interactive map.